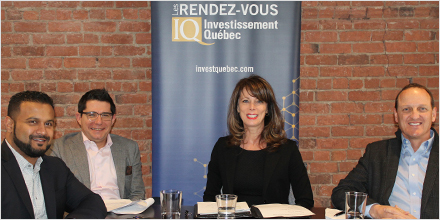 IQ Webinar: Learn How Québec Capital Helps Our Businesses Conquer the World! During our webinar moderated by Sylvie Pinsonnault (Investissement Québec), successful entrepreneurs Louis Têtu (CEO of Coveo), Dax Dasilva (CEO of Lightspeed) and Jean Paul Chauvet (Chief Revenue Officer of Lightspeed) talked about the reasons that motivated them to build world-class businesses in Québec. Learn about the strategies that promoted these companies’ rapid growth and find out how Investissement Québec and its partners can provide the necessary capital to support businesses that want to achieve world leadership in their areas of activity.